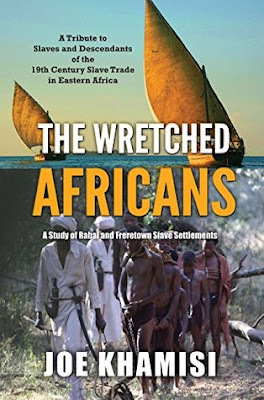 First of all I'd like to thank Joe Khamisi for reaching out to me and sending me his book for review, I really did not know anything about the South-East African slave trade, or the Arab slave trade neither did I know about the Rabai and Freretown slave settlement. This book narrates on the history of slavery in East Africa. The Arabs ravaged the land, instigate war to make it easier to capture African citizens in order to force them into slavery through the main slave market in Zanzibar. wasn't enough to stop the Arabs from smuggling Africans out of the continent, for that reason, British boats patrolled the Indian ocean in search of Arab dhows full of slaves. As expected, many were captured and Rabai and Freretown settlement was created in order to care for them. 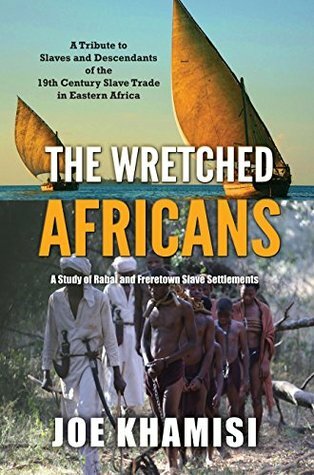 "The Wretched Africans" is a historical narrative, a challenging one for that matter, of the East Africa slave trade by a descendant of one of the survivors, Joe Khamisi. An insightful read that sheds light on the history of Africa. I was surprise to find out that Zanzibar was once a slave main market, also that before the slave settlement in Africa was created there was already one in India, where free African slaves were settled and educated and later returned to Africa to contribute to its "development" they were known as the Bombay-Africans. I also kept on wondering how the people in the African settlement identify themselves, as Africa is a place where ethnic identity is extremely important. This is a book I recommend to all lovers of African literature or anyone who would like to know about the East Africa slave trade. An enlightening read indeed.